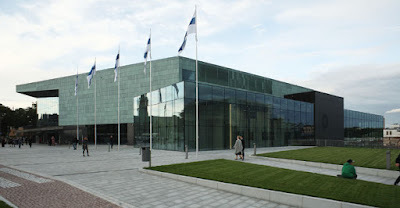 I visited the new Musiikkitalo, Helsinki Music Centre, for the first time this week. On 27.3.2012, I saw a West End/Broadway concert with Vantaan Viihdeorkesteri playing, Nick Davies conducting and David Shannon and Jacqui Scott singing. The evening's repertory consisted of about twenty very famous musical tunes. A bit too famous, actually. Surely most of the audience don't listen to musicals every day like me, but I'm certain everyone's heard Memory, Don't Cry for Me Argentina and Music of the Night before. The songs I guess the audience wasn't too acquaintanted with (Till I Hear You Sing, Electricity) were few and far in between. All in all, it's not that I mind hearing songs from popular shows. I just think it'd be lovely to sometimes have a Who Am I? instead of the omnipresent Bring Him Home. That being said, maybe the solists' history justifies some of these choices. Shannon has played Phantom and Jean Valjean in West End lately and will start a new run as Valjean this spring. Scott has performed parts like the title role in Evita and Grizabella in Cats. Maybe it'd be weird not to have these characters' big songs in there. What's more, though - I think some songs, like Circle of Life, were slightly odd choices for just two singers. Maybe actual duets would've worked better? I've heard big orchestra like this only a couple of times before. Out of those times, this night sounded the best, absolutely. The praise the Music Centre has received for their acoustics isn't all empty. The evening was a treat to the ears. Actually, if I'm completely honest... I enjoyed the instrumental pieces the most. The orchestra played medleys from Oliver!, A Chorus Line and The Producers, and while I also liked the vocalists, those were my favourite parts. I could've easily sat there for the whole night, just listening to the gorgeous tunes from the orchestra. Too bad musicals can't always be accompanied with as many instruments as here! As for the singers, I think Scott was more enjoyable to watch but Shannon to listen to. Shannon, then. I think he wasn't exactly in his element with faster, cheerier tunes like Luck Be a Lady, but with the ballads, Till I Hear You Sing, Bring Him Home, Can You Feel the Love Tonight... He truely excelled. The evening ended with a medley of ABBA songs. This part felt a little awkward to me. I got the feeling that the soloists, Scott especially, were trying way too hard to get the audience to clap and sing along the music. Did someone forget to tell them they're in Finland..? Seeing it was my first time in the Music Centre, I've no idea how wild the audiences who frequent it are - but singing and dancing along is something I certainly don't expect to do and also don't feel like doing at a concert hall. Also, I found ABBA's Thank You For the Music a slightly boring choice for the encore. I'd rather heard another musical song, seeing those were the focus of the night. That all said, I enjoyed myself a lot. The repertoire was mostly overdone, but luckily they made it sound good with nice vocals and a gorgeous-sounding orchestra! I got a newsletter from Helsingin kaupunginteatteri in my e-mail today. For those of you who are not so aware of how the Finnish theatre scene works: HKT is one of the biggest theatres in this country and famous for their musicals. They've produced the Finnish premieres of many huge Broadway and West End hits. Cats, Les Misérables, Miss Saigon, Beauty and the Beast, Mary Poppins, Wicked... Some argue these shows are not exactly high art, but people usually agree that they're good entertainment. Last fall, after the popular production of Wicked, HKT premiered a musical about Katri Helena, a famous Finnish singer whose music is popular among a bit older people. I shrugged that off as the theatre's attempt of attracting more mature audiences after the kid and teenager oriented Mary Poppins and Wicked. Surely they would return to the hit Broadway musical path next season? What would they give us this time? Another Disney musical, maybe The Little Mermaid? Or would it be wishing too much we would finally get a Finnish version of The Phantom of the Opera? Then I heard some rumours. I couldn't believe my ears. Today, the newsletter confirmed the vague whisperings. HKT's next musical on their big stage will be Fiddler on the Roof. Don't get me wrong. 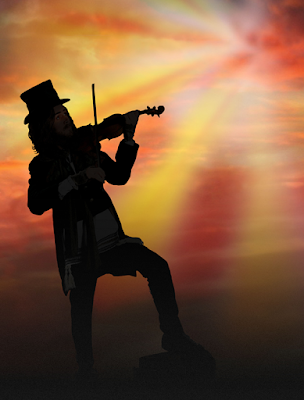 I'm not saying Fiddler on the Roof is a bad musical. To be honest, I have never seen it, and while I'm not into the music I've heard from it, I haven't heard all the songs either. Still, I don't think it's too hard to understand why I was shocked to learn the country's biggest musical stage is set to do Fiddler. As you can see, Fiddler is a huge favourite of professional and amateur theatres alike all over the country. Ever since it's Finnish premiere in 1966 - in Helsingin kaupunginteatteri, no less! -, there's hardly been a year without the piece playing somewhere in Finland. I've no idea how I've avoided the show this long, Fiddler's been performed so much I'd guess at least 80% of the Finnish population has seen it. After its Finnish premiere in 1966, Fiddler on the Roof was played for years in Helsingin kaupunginteatteri. With 450 performances and 319 327 watchers, it remains the most popular theatre production in Finland to this day. In other words, HKT's reviving the most popular, the most overdone, the most everybody-and-their-mother-has-seen-and-also-acted-in-this-one piece of musical theatre in the history of Finnish theatre. What happened to the theatre that used to produce popular, current musical theatre from Broadway and West End? Huge successes never seen in Finland before? Back in 1966, that used to be the case: Fiddler premiered here just two years after Broadway... HKT can boast about hosting the Finnish premieres of countless hit musicals. Was Wicked the last one of that sort? Are we to enjoy jukebox musicals about Finnish singers and revivals from times gone by from now on? And if they absolutely had to revive something that's already been seen in Finland... How about something every single amateur theatre hasn't done already? A couple of weeks ago there was discussion in the newspapers how HKT is handling their money oddly: keeping millions' worth of funding from the city of Helsinki sitting in their bank account. With that money, I'm sure they could afford something a little more interesting, a little more courageous than the safest choice available. Luckily some other theatres in Finland will have a bit more exciting 2012-2013 season. I don't think I'll be bringing my money to HKT to enjoy this trip down the nostalgia lane. A couple of days ago, I found out something that was released a month ago but that my stalker senses failed to reveal until this week. Premiere in Wasa Teater, 22.9.2012, performed in Swedish. The last three with a little caution - I haven't found any confirmation about their roles. These seem like the best matches, right? I'm going to be honest with you. My first thought was "what the hell." It's probably no surprise to anyone that after Les Mis, I'm for Sören Lillkung in pretty much everything. He was an amazing Javert, vocally the most amazing I could ever wish for. Such a deep, operatic, beautiful voice. Just like every Javert should have, in an ideal world... Of course I'm glad I'll get to see him in some other show! But then, let's think about J. Robert Spencer from Next to Normal's original Broadway cast album. This is where my initial thought comes from: Spencer's voice is pretty much as far from Lillkung's as you can get. Much lighter, gentler, very very different. Also, if I think about Helsingin kaupunginteatteri's Next with Juha Junttu in the role - pretty close to Spencer's style. So, I've no idea how Lillkung will handle this, vocally. He'll be very different from what I've used to. Note that when I say different I don't necessarily mean worse, not at all. How could I know! It's just that I'm finding it impossible, trying to imagine what he'll be like. Especially considering Dan's are some of my favourite songs of the whole show, I know every single note from the Broadway version by heart... Wonder what comes of this. Actually, Dan is my favourite character in the show, too. I know, it seems easy to jump into the conclusion that because my favourite Javert is going to play him he's of course my new favourite - but no. He's been my favourite ever since I saw the show for the first time. You can't help feeling for him. He does the best he can, supporting his family, but the situation keeps getting out of hand, leaving him powerless. He's just a human, one that makes mistakes, as we do. You can't always agree with the things he does, but you understand where his decisions are coming from. I love how his character develops. I'm excited to see what Lillkung does with the role! This I've known for quite some time, and I've been happy about it ever since. Even if rest of the production would've been cast with complete unknowns, I'd still gone to see it, for this bit of casting alone. That's of course because Tidermark was, hands down, the best Cosette I have ever seen. It's a short role that very easy to make very boring. Luckily Tidermark did the best job possible, showing as much character as you can during those few moments. No wonder Marius was in love with the girl, she was so adorable! Also, I really like her voice, I'm sure she'll make Natalie's songs sound good too. Character-wise, I find Natalie way less interesting than her parents. She's the goodie-two-shoes daughter who starts to rebel, not a very uncommon or an especially intriguing story. My uninterest, though, might be largely about the version I've seen and how Natalie was portrayed there, not the character herself. I'm sure a lot can be done with her, that she can actually be made more interesting. Remembering what I said about Tidermark's Cosette... I have high hopes. Harjanne is my favourite Enjolras in one respect: I think his voice suited the character perfectly, he's one of the best Enjolrati I've ever heard. Acting-wise, well, there were a couple of things... But maybe ranting about Enjolras's character is better left for another time. Especially considering I've seen Harjanne more than the other ÅST alumni here: I also saw him in Striking 12, Spring Awakening and even in that bit part in Legally Blonde. I guess I have to admit I'm a bit of a fan. As one of my friends keeps saying - he's a talented fellow! So, as if this casting wasn't good enough already, this just makes it a little more perfect! Henry is of course not a very developed character, but he can be quite fun and cute, as Petrus Kähkönen proved in Helsingin kaupunginteatteri. I'm sure Harjanne will be just as good. He'll sound amazing at the very least! When it comes to the piece in general, Next to Normal is actually one of the best musicals I have ever seen. It's simple - Next has got everything a good musical should have. A really strong story with strong characters, accompanied by strong, original music. Especially remembering the countless jukebox musicals being made everywhere these days... It's really refreshing to see something like Next, a brilliant original musical just a couple of years old. I liked the 2010-2011 Helsingin kaupunginteatteri version okay, but seeing the show three times was maybe more about loving the source material, not the production itself. Well, most of the actors varied from good to great, anything with my long-time fangirl crush Tuukka Leppänen can't exactly fail in my eyes... But something about the direction distanced me from the events. Maybe it was the staging, which I found simply ugly. So, I can't wait to see what this production, with Victoria Brattström directing, will be like. Maybe it'll be an interesting fall, musical-wise, even if a couple of old favourites happen to close this spring! And hey! If you feel that this is not the version for you to see (if you don't know the story and aren't skilled at Swedish, it might be hard to follow along)... Tampereen Työväen Teatteri will also do Next to Normal next fall, with Eriikka Väliahde, Puntti Valtonen and others in the roles. With this, and two productions of Hair popping up in Finland at the same time, greetings to theatres: try to spy each other a little more carefully!